720° (a.k.a. 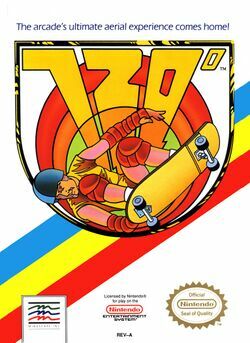 720 Degrees) is a skateboarding arcade game developed and published by Atari released in 1986. It is notable in that along with BMX Simulator, it is one of the first extreme sports video games. The game was ported to the Commodore 64 (twice) in 1987, the Amstrad CPC and ZX Spectrum in 1988, the Nintendo Entertainment System (NES) in 1989, and the Game Boy Color in 1999. There is also an unreleased port for the Atari Lynx. Sinclair User described it as "US Gold's finest hour". On Side 2 of the game cassette, there was a recording of the music from the original arcade game. Emulated versions of the game are included in Midway Arcade Treasures, first released in 2003, and Midway Arcade Origins, released in 2012. 720° has a unique timed structure that requires the player score points in order to keep the game going. The game's name comes from the "ultimate" trick, turning a full 720° (two complete circles) in the air after jumping off a ramp. 720° has the player controlling a skateboarder ripping around a middle-class neighborhood. By doing jumps and tricks, the player can eventually acquire enough points to compete at a skate park. This page was last edited on 24 April 2014, at 00:37.